Black Dog & Leventhal, 9780316395472, 656pp. The obituary page of The New York Times is a celebration of extraordinary lives. 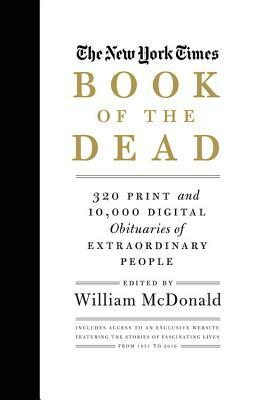 This groundbreaking package includes 300 obits in the book with exclusive online access to 10,000 more of the most important and fascinating obituaries the Times has ever published. William McDonald, The Times' obituary editor who was recently featured in the award-winning documentary Obit, selected 320 of the most important and influential obits from the newspaper's archives. In chapters like "Stage and Screen," "Titans of Business," "The Notorious," "Scientists and Healers," "Athletes," and "American Leaders," the entries include a wide variety of newsmakers from the last century and a half, including Annie Oakley, Theodore Roosevelt, Joseph Stalin, Marilyn Monroe, Coco Chanel, Malcolm X, Jackie Robinson and Prince. Also included is a web-key which allows instant access to an exclusive website featuring 10,000 selected obituaries which are easily searchable by name, theme, dates, and more. Designed with more than 150 black-and-white photographs, this tomb-sized book plus website package is the perfect gift. Bill McDonald has been the obituaries editor for The New York Times since 2006. A former editor at Newsday on Long Island, joined the New York Times in 1988 and has held numerous positions at the paper including copy chief of the national news desk, assistant national editor, deputy editor of Arts & Leisure and deputy culture editor. He was part of the team that won the Pulitzer Prize for National Reporting in 2000 for the series,"How Race Is Lived in America". He is married and lives in Manhattan. The New York Times is regarded as the world's preeminent newspaper. Its news coverage is known for its exceptional depth and breadth, with reporting bureaus throughout the United States and in 26 foreign countries.